International World Press Freedom Day. The 3rd of May is the World Press Freedom Day. Freedom Day was first proclaimed by the UN General Assembly in December 1993. 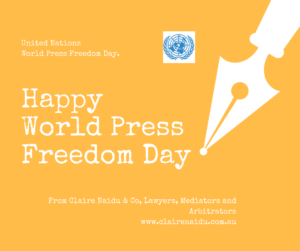 The United Nationals World Press theme of 2018 highlights the importance of an enabling legal environment for press freedom, and gives special attention to the role of an independent judiciary in ensuring legal guarantees for press freedom and the prosecution of crimes against journalists. The theme also aims to explore legislative gaps with regard to freedom of expression and information online, and the risks of regulating online speech.